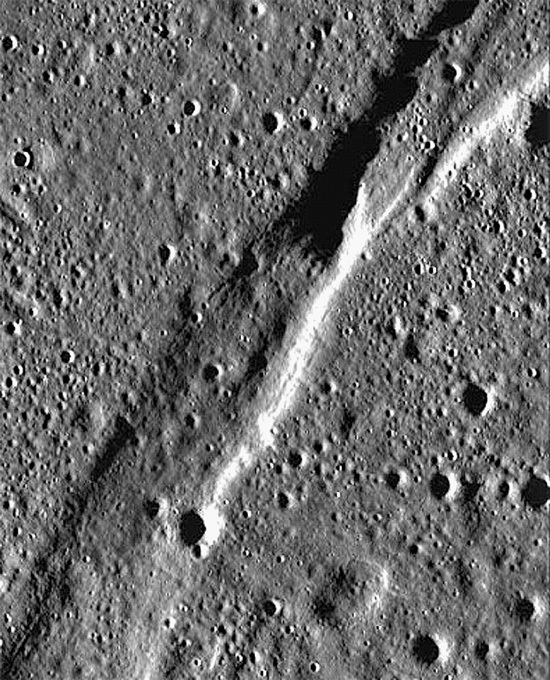 Did tectonic and volcanic forces create the wide, parallel trenches on the Moon? The Moon has seen cataclysmic devastation at some time in its past. There are giant craters, wide and deep valleys, and multi-kilometer long rilles crisscrossing its surface. Conventional theories postulate that the Moon has undergone intense selenological activity early in its history. The rilles and offset slip faults, known as “graben,” are said to result from slow crustal movements similar to those that cause terrestrial earthquakes. This theory implies that the Moon was born long ages ago, perhaps several billion years or more ago, and has not changed much since. Most scientific theories are parochial in nature. They take their cues from what is observed on Earth, and use those data to model formations observed on other celestial bodies. However, since there is no evidence that the Moon was once subjected to tectonic activity, Electric Universe theory proposes that the idea should be reversed: structures in space ought to model what is found on Earth. Similar formations are observed wherever telescopes and satellites look. A reasonable hypothesis would demonstrate how airless, frozen bodies can compare to hot, wet planets like Earth. Since consensus scientific reports give electricity little credence, although it is many orders of magnitude more powerful than gravity, thermal shock or crustal spreading is nothing when compared to the effects of a multi-trillion joule electrical discharge. Selenologists possess few tools that can help them understand planetary scarring, since there are no courses in electricity needed in their field. Plasma physicists realize that charged objects immersed in electric fields develop Langmuir sheaths, named after plasma pioneer Irving Langmuir. Langmuir sheaths isolate charged objects from each other inside double layers. If the charged objects are planets or moons, they might be surrounded by double layer plasmaspheres. Laboratory experiments demonstrate that when charge sheaths collide they cause electrical breakdown. A large enough charge flow will initiate an electric arc. If smaller charge sheaths in the laboratory behave in a certain fashion, then larger planetary sheaths could trigger gigantic lightning bolts. Such interplanetary discharges could rip rock strata apart, carve surfaces with a plasma “torch” effect, and create intense heat through electromagnetic induction. The Moon does not possess a plasmasphere. However, that does not mean that it was not enveloped in a charge sheath at some time in the past. Also, during part of its orbital path Earth’s plasmasphere encompasses the Moon, so electric discharge effects involving our planet could easily have included it. Rather than stretching or collapse, the rilles and graben on the Moon could have been incised by electric discharges at some time in the recent past.